Smart contact lenses with virtual reality graphics and information just got a step closer. 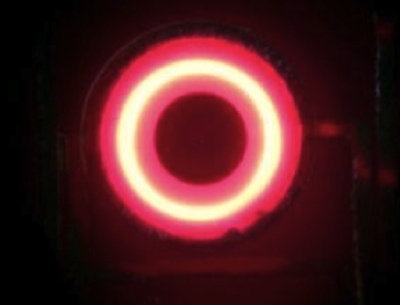 Professor Babak Parviz has added a power harvesting antenna to his contact lenses with microcircuits. I'm assuming that the device uses a system similar to that which powers Passive RFID tags. Parviz hopes that smart contact lenses could provide heads-up displays with a much wider field of view, presenting an image that appears to float fifty centimeters in front of the user. Fitting a contact lens with circuitry is challenging. The polymer cannot withstand the temperatures or chemicals used in large-scale microfabrication, Parviz explains. 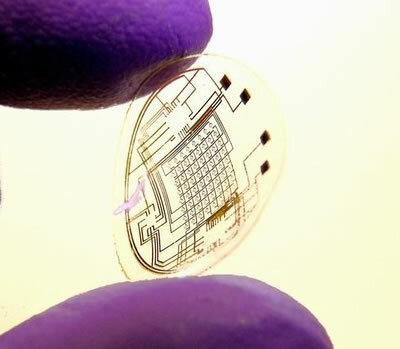 So, some components – the power-harvesting circuitry and the micro light-emitting diode – had to be made separately, encased in a biocompatible material and then placed into crevices carved into the lens. One obvious problem is powering such a device. The circuitry requires 330 microwatts but doesn't need a battery. Instead, a loop antenna picks up power beamed from a nearby radio source. The team has tested the lens by fitting it to a rabbit. Parviz says that future versions will be able to harvest power from a user's cell phone, perhaps as it beams information to the lens. They will also have more pixels and an array of microlenses to focus the image so that it appears suspended in front of the wearer's eyes. It seems clear that the scleral contacts describe a display upon which images or data can be viewed, and the images do not appear to be projected from elsewhere upon the surface of the lens. As far as I know, this is the first reference to the idea of powered smart contact lenses. Fans of Vernor Vinge also recall the very detailed treatment of this idea in his award-winning 2006 novel Rainbows End and in his 2001 story Fast Times at Fairmont High; see the description of smart contact lenses to read relevant bits from both stories. From New Scientist and Babak Parviz; thanks to BajaB for suggesting this story.